Topol-M mobile TEL mounted on the army truck MZKT 79221. Image courtesy of ru:Участник:Goodvint. 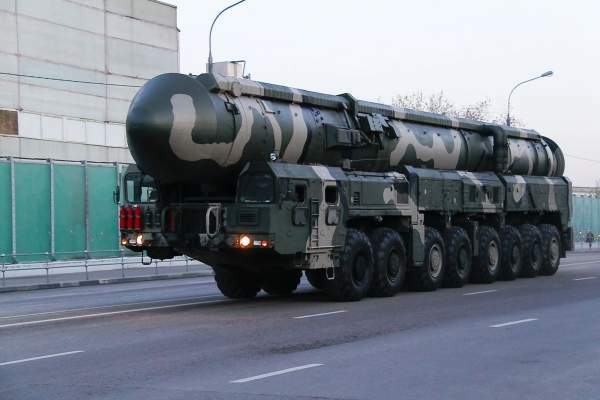 Topol-M is a three-stage solid-propellent intercontinental ballistic missile. Image courtesy of Vitaliy Ragulin. Topol-M mobile missile system at Red Square during parade repetition in Moscow. Image courtesy of ru:Участник:Goodvint. A close view of the Topol-M missile launching container. Image courtesy of ru:Участник:Goodvint. Topol-M (Nato code name: SS-27) is an intercontinental ballistic missile (ICBM) in service with the Russian strategic rocket forces (RVSN). It was developed by the Moscow Institute of Thermal Technology (MITT) and is an upgraded version of the RS-12M Topol missile. "The Topol-M mobile missile is fired from a transporter erector launcher (TEL) canister." 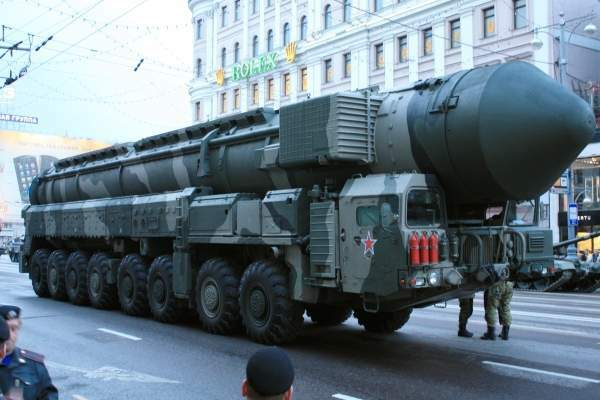 Topol-M is the first ICBM developed by Russia after the breakup of Soviet Union. The missile is being launched from underground silos. The Russian Army plans to deploy about 300 missiles on transporter erector and launcher (TEL) vehicles too. Two Topol-M silo-based missile systems were deployed in December 2010 in the Tatishchevo Missile Division near Saratov in southwest Russia. About 52 silo-based and 18 mobile Topol-M missile systems were in service as of January 2011. A total of 450 to 500 missiles are expected to be deployed between 2015 and 2020. The development of Topol-M was initiated by the MITT and Yuzhnoye Design Bureau in late 1980s. The Ukrainian firm Yuzhnoye withdrew from the programme and all documentation was shifted to MITT in 1992, following the dissolution of the Soviet Union. The missile development was consolidated inside Russia. The programme was approved by the Russian government in 1993. The producers consortium led by MITT included about 500 Russian firms. The final assembly was made at the Votkinsk Mechanical Plant. The first missile was test fired in December 1994. The first silo-based regiment was declared operational in 1998. The system was officially accepted into service in April 2000. The first test of the mobile launcher was conducted in April 2004. The first flight version of the missile was delivered to the Russian Federation in 1995. The first three mobile Topol-M missile systems entered service with a missile unit stationed near the town of Teykovo in December 2006. RS-24, a multiwarhead variant of Topol-M missile, was test fired from the northern launch site in May 2007. The missile variant is capable of carrying multiple independently targetable re-entry vehicle (MIRV) warheads. 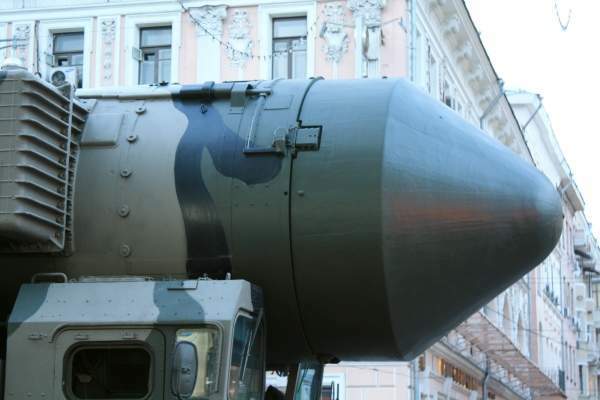 The Topol-M is a three-stage solid-propellant ICBM. It carries a single nuclear warhead under US-Russian arms control treaties. The design can support MIRV warheads. The missile can reach a range of 11,000km at a speed of 17,400km/h. The missile is cold launched using a special booster called PAD which allows the first stage to fire into air by pushing out the missile from the storage container. The motors for the first stage were developed by the Soyuz Federal Centre for Dual-Use Technologies. Topol-M is directed by autonomous digital inertial navigation system using an onboard GLONASS receiver. The burn time of the engine was minimised to avoid detection by the present and future missile-launch surveillance satellites during boost phase. The missile carries targeting countermeasures and decoys. It can perform evasive manoeuvres in terminal phase to avoid the hit of interceptor missiles. The flat ballistic trajectory of the missile complicates the interception by the anti-ballistic missile (ABM). The missile is shielded against radiation, electromagnetic pulse (EMP) and nuclear blasts, and can withstand a hit from laser technology. The silo-based missile deployment site includes ten isolated silos. The underground silos were originally developed for R-36M and UR-100N missiles. The high cost elements such as protective covers and control systems were retained with minor changes. The missile uses the existing launch control and communication systems. 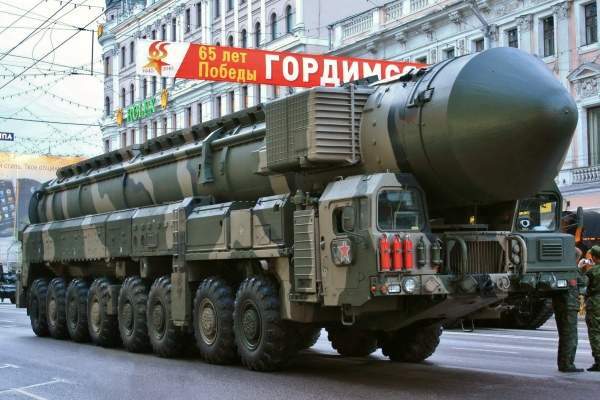 "Topol-M is an intercontinental ballistic missile (ICBM) in service with the Russian strategic rocket forces." The underground site consists of a command and control bunker, security, power supply and nuclear blast detection systems. The launch complex was designed to survive hits from high-precision conventional weapons. The Topol-M mobile missile is fired from a transporter erector launcher (TEL) canister mounted on the MZKT-79921 cross-country, a modified eight-axle mobile launch vehicle. The TEL was developed by the Titan Central Design Bureau and produced at the Barrikady Plant. The mobile launcher can launch the missile at any time, even on a rough terrain route. The chassis is fitted with jacks to level the launcher. The onboard gas and hydraulic systems maintain the elevation of the container.